UK Cheap Web Hosting is for those looking for a way to host their website in a cost efficient manner. Where large business often have a budget that covers any web hosting costs, most small companies and individuals can’t justify spending vast amounts to get their websites live. The web hosting providers here offer good service at competitive price points. If you’re looking for similar online services, consider our Cheap Dedicated Server or Personal Web Hosting categories. 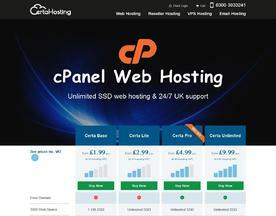 Certa Hosting deliver the best cheap hosting in the UK. With three great value, low cost packages to choose from. We use 100% SSD disk drives, offer unlimited email accounts and a 30-day money back guarantee. Try us today.